Today I am delivering my poster at the International Responsible Innovation meeting in the Hague, Netherlands. As you see above it is about alternative food provisioning networks both in Italy and the USA. The poster was prepared with Utrecht University anthropologist Cristina Grasseni. 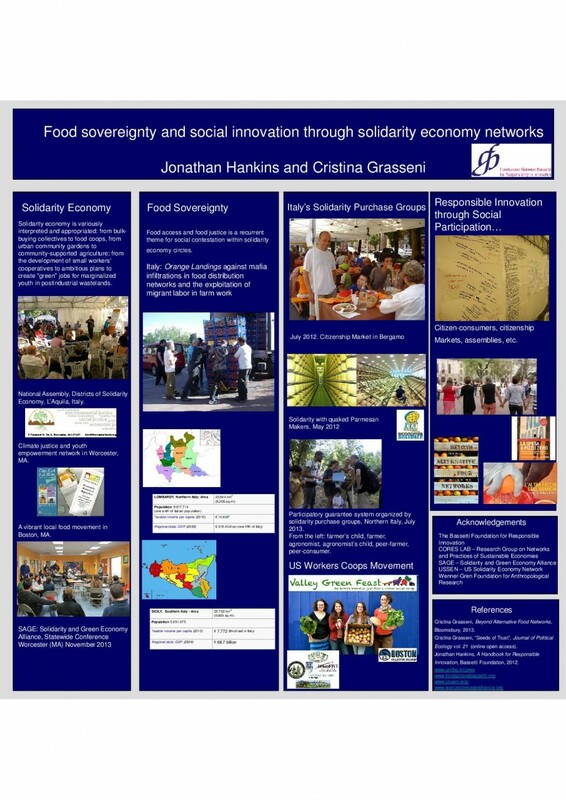 Food sovereignty and social sustainability through solidarity economy networks: a case study of responsible innovation describes how grassroots networks are rethinking the core elements of contemporary society: the market, the commons, and the role of the individual as citizen, consumer, and producer. From “political consumers” to “consumer-citizens”. The presentation is based upon fieldwork conducted in Italy and the USA that aims to provide data about concrete examples of real-world, bottom-up, responsible-innovation attempts in the field of provisioning for the family. Much of the Italian research is described in Grasseni’s latest book that I reviewed as part of my food series, while the US data is as yet unpublished and out for its first airing. The Netherlands government has been at the forefront of responsible innovation research for several years now, as it has funded the project that this conference relates to. In some ways it has made the country a hub for European researchers in the field, and I myself will transfer this year to Utrecht to follow developments first hand. Readers who wish to review the extended abstract can find it here.